Your roof forms such an integral part of your home, in fact 30% of your home is your roof, yet we often forget to regularly inspect and maintain this structure. So if you are in the research stages of connecting with a roofing company it’s important to engage with a professional company that is able to provide accurate information and effective long lasting roofing solutions. Our philosophy in providing individual attention to each project means you receive the benefit of tailored options to suit your budget and roof restoration requirements to achieve the end result you have anticipated. We have earned a reputation built around our core values of honesty, integrity and reliability. This means that Roofline does not employ commission driven salesmen, only knowledgeable and experienced tradesmen who will provide you with a free, written quotation with no obligation, so call us today! We are committed to providing our customers with complete peace of mind when they choose to work with us, so we have backed our workmanship with a 7- year guarantee and a 10-year written guarantee on materials at no extra cost. Respected- Roof line is your local, Sydney Based roofing specialists. We have consistently been recommended for providing exceptional quality roof restoration services using the very latest in equipment and technologies. Whether we are providing roof cleaning, roof painting or total roof restoration services you are guaranteed of a quality outcome. 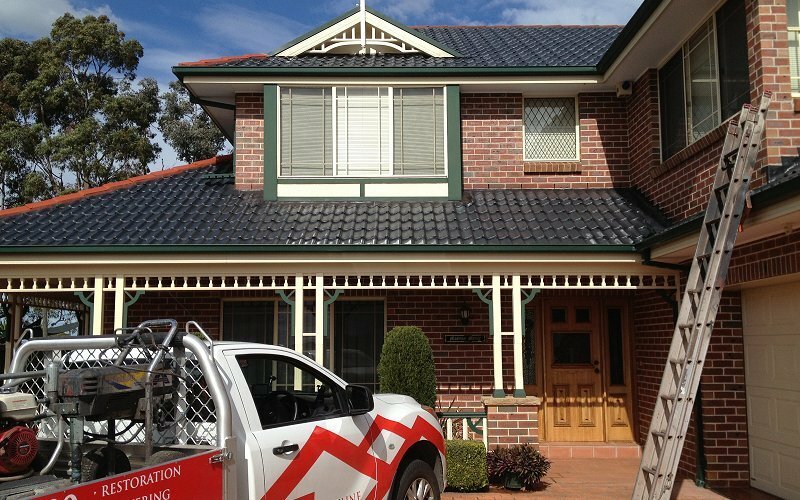 Roofline services both residential and commercial properties providing a range of roofing services across West Pennant Hills and surrounding areas of Sydney. Our highly experienced roof specialists utilize effective application methods to keep your roof in pristine condition. Experience- If you are looking for highly experienced, qualified roofers, Roofline’s teams have more than 20 years’ experience servicing West Pennant Hills and the surrounding suburbs of Sydney. Quality- Our teams ensure you receive prompt, friendly and personal attention when we carry out work on your property. Roofline only use the highest quality materials ensuring your Roof restoration or roof repair lasts. Your roof represents 30% of your home and significant surface area that is continually exposed to external elements. Our roof restoration services range from a relatively simple cleaning process to painting, complete tile replacement and repointing or a combination of the above. Regular inspections prevent any minor damage from escalating. Our professional team of roof restoration experts provide all our customers with consistent top-quality workmanship on all our roof restoration projects in West Pennant Hills. Rooflines comprehensive high pressure clean of your roof ensures any build-up of algae, moss or lichen will be removed which instantly transforms the appearance of your home. Our onsite teams have many years of industry experience, so you are assured of professionals who will provide above standard customer service and cleaning services beyond your expectations at a surprisingly low cost. Our teams have extensive industry experience providing West Pennant Hills customers with quality services for over 20 years. Our qualified roof plumbers are equipped to professionally and competently install your home gutters and specialise in custom made flashings as well as custom-made box guttering. Now that our roof looks all new the spouting looks old and worn can you help? It is often the case that once the roof has been refreshed the spouting and paintwork looks old and stand out more. If you would like to give your home a complete exterior refresh. Rooflines can assist by providing additional value-added services to give your home a complete updated look by either replacing gutters, downpipes or by replacing/ repairing missing tiles, fascia boards and soffits. We have overflowing gutters and water running down the walls– Why? While this will require investigation, Roofline’s team of roof cleaning experts have often found that when moss is left to accumulate in the various rain channels it results in several blockage and moisture problems. A good thorough high pressure clean, to remove the build-up of moss usually clears the gutters and increases the drainage. If you need more information of would like to schedule an appointment for an obligation free quote, we are always on hand to answer your questions. So, get in touch today.